?? This article used to be part of my Cirque du Soleil Primer article, but I decided to remove it from there and make it its own article instead. Note that this World Record was already set in September 2007, much over 1 year ago.?? 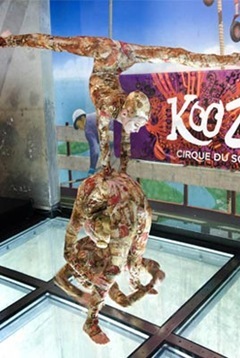 Did you know that three of Cirque du Soleil’s contortionists, Natasha Patterson, 10, born in San Francisco, Julie Bergez, 14, from France and Dasha Sovik, 15, from Russia, who perform in KOOZA, the Cirque’s latest touring show, attempted to and actually set a new Guinness World Record??? for the Highest Circus Act ever performed? Well, they did just that on September 25, 2007 at the top of Toronto’s CN Tower, the World’s Tallest Freestanding Tower. This feat was performed in the Glass Floor observation deck, 342 meters (1,122 feet) above the ground and as high up on Toronto’s CN Tower as you can get as a human without getting into serious trouble. The CN Tower-Canada’s National Tower- is standing tall as the defining landmark of Toronto with a total height of 553.33 meters (1,815 feet, 5 inches). This means that the record by the three teenage girls from Cirque du Soleil can be broken, but it would have to be a much windier and chilling performance in lofty heights and exposed to the elements, or somebody has to build a higher tower. Not an easy task obviously, because the tower was already built in 1976 and nobody built a higher one in over 30 years yet. Watch full video of this performance on YouTube. *Note: Natasha might have been 11 and Dasha 16 already when they made the performance on September 25, 2007. I don’t have their exact birth dates to say for sure. 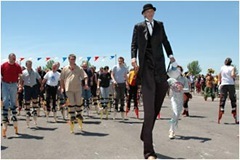 There was another World Record that was set by Cirque du Soleil on June 16, 2004 for the most people walking on stilts at the same place and at the same time. Cirque gathered 544 of its employees at their corporate headquarters in Montreal, Canada and set the new record. I wrote about this in a separate article, if you want to learn more about this (including a some video material). It has long been taken away from Cirque since then. The record was 625 by May, 2009. 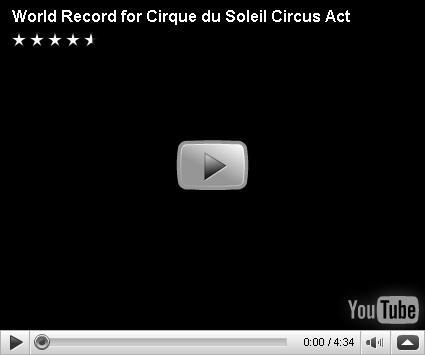 Cirque attempted to recapture the record on June 16, 2009 at 5 locations worldwide simultaneously, in Orlando, Florida;?? Moscow, Russia; Montreal, Canada; Macau, China and of course in Las Vegas, Nevada. If they succeeded or not is still undetermined. The auditors of the Guinness Book of World Records are still counting :). Worldwide Cirque du Soleil cast, crew and staff went to great heights to attempt to break the Guinness World Record for the most people to simultaneously walk on stilts on June 16, the date of its 25th anniversary. In Las Vegas, nearly 300 Cirquesters took over the sidewalk in front of Bellagio to attempt the 328 foot distance on stilts that had to be at least 12″ off the ground. Stay tuned to see if we broke the record. But even if we didn’t, everyone had a great time!!! However, the 300+ stilts walking Cirque du Soleil employees in front of the Bellagio hotel and casino in Las Vegas, Nevada was a spectacle nevertheless and I am sure that people in Vegas and the other 4 locations worldwide had a lot of fun, world record or not. You can watch a 1:34 minutes video of the 2009 event at Facebook.com or Watch the video on YouTube .